AVAILABILITY- We currently have openings for annual Lawn Mowing and Lawn Health Programs as well as our all-inclusive LawnStrong Program. ONE-TIME-SERVICES - (For example: one-time mulch install or a one-time leaf removal) These are available when our service schedule can accommodate them. This can be difficult at peak season or on short notice. Planning ahead helps us help you. 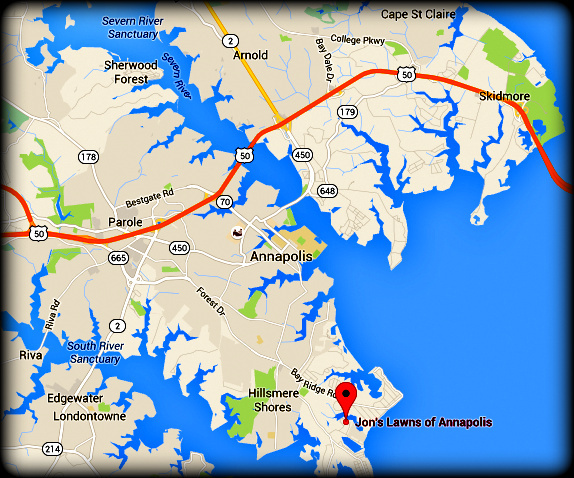 SERVICE AREA - Due to the cost of travel our service area is limited to ANNAPOLIS, the part of Edgewater north of the South River, parts of RIVA and parts of ARNOLD. MOWING SERVICE - mowing, edging, maintenance LAWN HEALTH - fertilizer, weed control, soil testing MULCH BED SERVICE - mulch, weeding, bed redefining LAWN REJUVENATION - aeration, seeding, lawn repair LAWN CLEAN-UP - leaf and debris removal, disposal LAWNSTRONG - all-inclusive, custom program FREE Consultation and Quote!